You are a kind person ready to share the experience and give a help to people in need. You always know the answers on all the questions - at least you have your opinion about everything. You can be a successful social activist, or volunteer as you sincerely care about the problems in our world. You are apt to oratorical activity, and your natural curiosity makes you a nice lawyer, psychologist, politician, business owner and organizer. 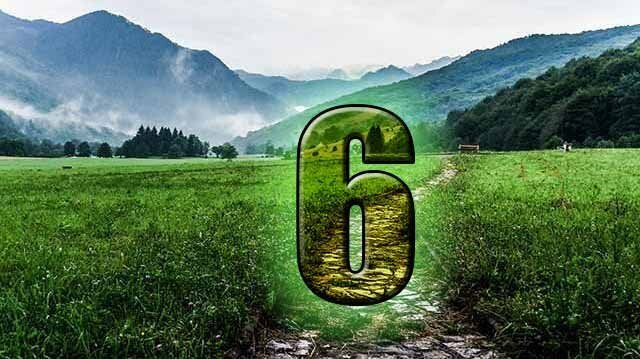 Number 6 provides support and is a person to rely on. Taking into account your natural curiosity and desire to help you often disturb the private life of people. You need to pay attention to your behavior, as you can be quite intrusive. Give help when the person asks for it, but not when you want to give an advice. You have a strong inner core that helps you through life and attracts people. You need to think about the love choices in life. As you are very sensitive, partners with weak sides or broken heart attract you simply because you can help them restore, but it is not the love choice. It is the choice of self-esteem. In some cases you may subconsciously repress your partner in order to be in continuous circle of giving your help. You shouldn’t be the saving belt for everyone. Try to find life for yourself, find an unusual hobby or challenge yourself with something interesting. Otherwise, you are in the great danger to live your life for someone else, and that sharp feeling of dissatisfaction can haunt you. Do you need it? You often help people, but you rarely feel the feedback from them. Some sense of underestimation may be present. Try to be self-sufficient. People instinctively want to talk with you, sharing their pains and problems and sometimes it pushes you into the depression. Your family is happy to have you, as you know and respect the needs of every member. Your children have a nice parent. Though, you can be very bold with your care, but it is always justified. You are a good partner for marriage too, as you are ready to share joys and sorrows. You are loyal to your principles and ideas about marriage and relationships. You may have some problems with body fit now or in the future. Staying in shape for you is harder than for other people. So, make sport a habit and keep yourself in comfortable and healthy condition. Slowly step by step limits are way easier than sudden changes in lifestyle, so take your time.